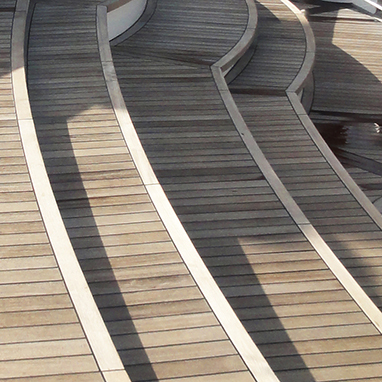 Deckings consist of real wood, PVC or polyurethane. With real-wood deckings made from teak, it is particularly important to durably protect the joints against water intrusion. For this application, adhesives and sealants must fulfil the highest requirements regarding UV, salt water and fresh water resistance. Additional stress is caused by the wood itself (e.g., teak oil or tannins) resp. by the cleaning agent used to regularly clean the decks. The joints of timber strip decks must allow permanent movement absorption and must be easy to process and sand at the same time. 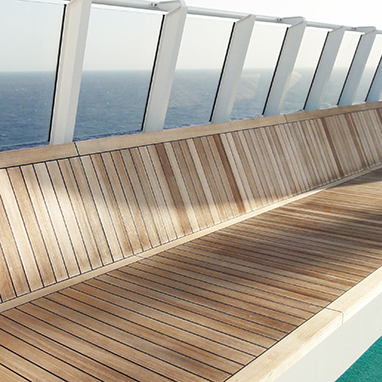 Deckings made from teak, PVC or polyurethane are increasingly popular both on private boats and on cruise ships. They are installed not only for optical reasons, but also ensure that the deck is slip-resistant, offer insulation both in winter and in summer and protect the substructure from corrosion and solar radiation. Deckings are bonded over the whole surface. This prevents cavities in which water could accumulate. Depending on the construction of the ship and the type of decking, KÖMMERLING offers the proper system that fits the respective purpose. 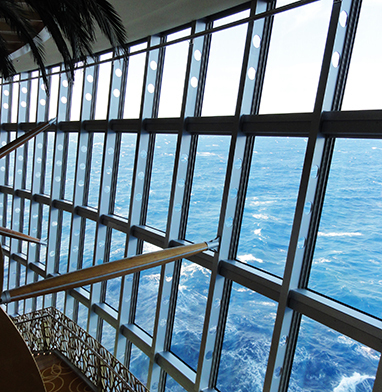 On ships, bonded windows enable architectural freedom, modern design and novel types of constructions. Despite the lack of space, frameless windows support the illusion of wide spaces and limitless views. On the water, such façade systems are subject to strong movements and torsions. In addition, they must resist strong UV radiation and all types of weather. KÖMMERLING secondary sealants, cast resins, panel adhesives and weather sealants help realise such complex projects. From the manufacturing of the windows via assembly to sealing: KÖMMERLING has suitable solutions. 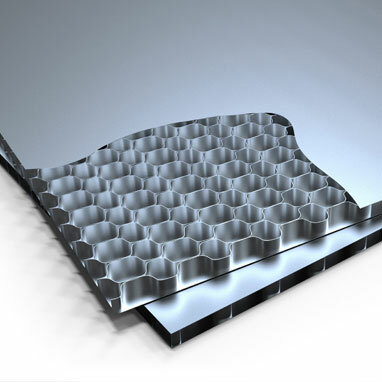 Sandwich elements significantly reduce net weight without losing their intrinsic properties. Materials as diverse as wood, metal, plastics or ultramodern composites with a foam or honeycomb core are used in this context. Conventional joining methods such as rivets or screws result in damage of the thermal insulation or the components through deformation or corrosion. The use of adhesives and sealants prevents this. Quite on the contrary: they actually increase rigidity and decrease the weight of the panel. They are therefore used in many areas in boat and ship building. For example, walls, doors, decorative panels, interior linings, floor plates and ceilings are manufactured in this way. 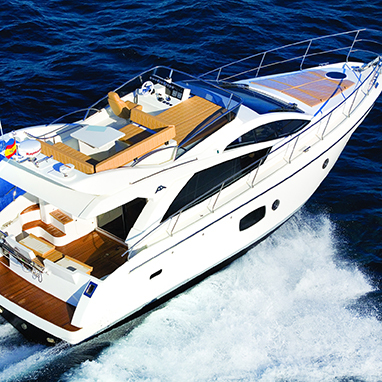 In modern yachts made from GRP or aluminium, the deck-hull connection and the mounting of the flybridge constructions are some of the components that must endure high mechanical stress. By using adhesives, vibrations are reduced, different elongations are balanced and shocks are absorbed. Whether used for having fun in the sun, for diving or fishing, or by fire fighters, sea rescue teams and military - inflatable boats are allrounders and are equipped even for the toughest jobs. Whether racy or comfortable, luxurious or functional: they prove their multi-talents every day on rivers, lakes and oceans. 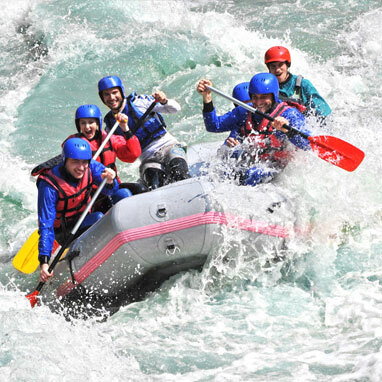 Depending on the type of boat and the usage area, PVC, TPU, Hypalon or neoprene are bonded. In order for an inflatable boat to provide many years of joy, the bonding must securely provide its service for many years without any loss of function. Resistance to UV, temperature and hydrolysis are particularly important in this context. KÖMMERLING adhesives master these challenges superbly and ensure that every trip will be great. Wire tie mounts, hose and cable clamps, studs, standoffs and floating nut plates are only some of the wide variability of mounting solutions we offer. 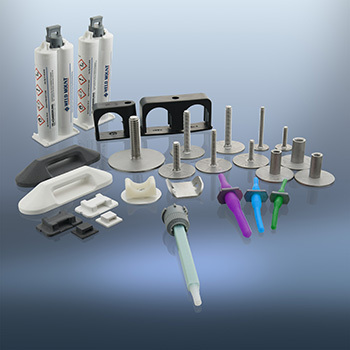 All fasteners are mounted with our appropriate non-sag adhesives which hold the parts in place on a vertical or overhead surface. For example surface bonding Weld Mount fasteners eliminates drilling holes into the core eliminating the danger of delamination due to water intrusion. Interested? Learn more about additional benefits on www.weldmountsystems.eu.